4TU.Ethics colleagues are cordially invited to Taylor Stone’s PhD Defence. On 21st January he will present and defend his dissertation “Designing for Darkness: Urban Nighttime Lighting and Environmental Values.” Following the defence there will be a reception and a panel discussion with some of the committee on “Re-imagining the City at Night.” Please note that both the defence and the panel are public (… so feel free to pass along to anyone who may be interested). Artificial illumination has had profound and far-reaching impacts on the development, use, and perceptions of urban nights, and has brought with it many benefits. However, in recent years its adverse costs and effects – commonly referred to as light pollution – have emerged as a topic of concern. Nighttime lighting uses enormous amounts of energy, costs billions of dollars annually, can be detrimental to the health of humans and ecosystems, and cuts off access to a starry night sky. Addressing these impacts, and more fundamentally understanding the underlying values shaping contemporary discourse, is a complex and pressing challenge with moral, aesthetic, political, and technical dimensions. This dissertation takes up this challenge by offering a critical examination of the historical roots and normative presuppositions shaping the concept of light pollution. This critique leads to the proposal of an alternative normative framework: instead of focusing on reducing lighting, it argues for fostering darkness in urban nightscapes. A designing for darkness approach is developed on two interrelated levels. The first is conceptual, exploring the relationship between darkness, illumination, and environmental values. 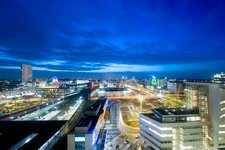 The second is practical, proposing first steps towards realizing darker nights via the responsible design of new and emerging technologies, namely LEDs and autonomous vehicles. Taken together, the chapters of this dissertation weave together a critical investigation and constructive contribution to a pressing urban challenge for the 21st century. Nighttime lighting is foundational to the design and use cities at night. Artificial illumination effectively creates the city at night, carving space and time out of darkness. New innovations to how we light cities can have far-reaching effects on issues such as sustainability, safety, commerce, nightlife and ‘24/7’ societies, mobility, and social justice. Yet, because of the immense scale and seeming permanence of our lighting, we take the existing infrastructure as a given. It all too easily fades into the backdrop of daily life, only noticed when it fails or during special events. But, what if that wasn’t so? What if we re-focused our attention on the generative force of urban lighting? Imagine that we could flip a switch, and reset our nighttime lighting. 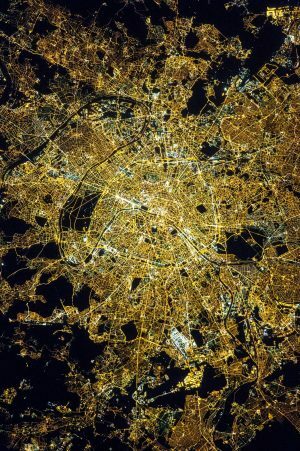 What sort of urban nightscapes would we want for our future cities, and why? With new technologies on the horizon (e.g., smart systems, autonomous robotics, etc. ), it is possible to design innovative lighting strategies and novel nighttime environments. But, what exactly should a “new” urban nightscape look like, and why? Should it be drastically different? What values (environmental, social, aesthetic) should inform and drive the technological innovation, design and policy choices, and use patterns? And, how can (and should) future visions be enacted? Through exploring these questions, we can start to envision a future of urban nights radically different from those of the 20th century. The Department of Technology, Policy and Management of Delft University of Technology is hiring two PhD candidates for a project on crowd-based innovations. For one of these positions, we are looking for a candidate with a background in applied ethics and affinity with technology and engineering. The “crowd” increasingly seems to be key for innovation in all kind of sectors, e.g. crowdfunding, open platforms, citizen initiatives for energy production, or the sharing economy. Such crowd-based initiatives provide many opportunities for innovations in socio-technical systems, but also significant challenges because they often occur in the context of traditional, well-established, institutional and governance structures and practices. In this research project we will study how to deal with the conflicts that can arise where crowd-based innovations meet existing structures. The goal is to design governance arrangements so that the power of mobilising people and organisations can be combined with legitimacy and responsible innovation. We are looking for two PhD researchers, one applying a normative perspective, and one applying an empirical perspective. The candidates will closely collaborate to combine both perspectives. Date: November 21, 2016; 15:30 – 17:00 hr. The debate on the experimental method, its role, its limits, and its possible applications has recently gained attention in autonomous robotics. If, from the one hand, classical experimental principles, such as repeatability and reproducibility, play as an inspiration for the development of good experimental practices in this research area, from the other hand, some recent analyses have evidenced that rigorous experimental approaches are not yet full part of the research habits in this community. In this presentation, by investigating autonomous robotics, I will claim that the traditional notion of experimentation cannot be always applied as such to computer engineering and I will propose that the notion of explorative experiment is a good candidate to be considered in some situations. By explorative experiments I mean a form of investigation of novel and interesting ideas or techniques without the typical constraints of rigorous experimental methodologies. These are experiments that are driven by the desire of investigating the realm of possibilities pertaining to the functioning of an artefact and its interaction with the environment in the absence of a proper theory or theoretical background. Moreover, while recognizing a substantial continuity of the engineering sciences with the natural ones, I will try to show why the latter need not only an adaptation from the traditional frameworks already established in the philosophy of science (Staples 2015), but also a shift from them. In my endeavor, I plan to move along three different but interconnected directions. The first one deals with the notion of directly action-guiding experiment, as characterizing a significant part of the experimental practice in autonomous robotics, in opposition to the one of epistemic experiment. The second direction concerns the debate around engineering epistemology, and whether adapting frameworks from the traditional philosophical debate can suffice to take into account the peculiarity of the discipline. Finally, the third direction acknowledges the empirical turn in the recent philosophy of technology, introduces the framework of technoscience as an engineering way of being in science, and invites philosophers of science to take this notion seriously in order to shed light on a range of questions that have been neglected so far. Viola Schiaffonati is associate professor at Politecnico Milano. She got the Laurea degree in Philosophy from Università degli Studi di Milano in 1999 and the PhD in Philosophy of Science from Università di Genova in 2004. She has been visiting scholar at the Department of Philosophy of the University of California at Berkeley during the academic year 2000/01 and visiting researcher at the Suppes Center for the Interdisciplinary Study of Science and Technology of the Stanford University in 2005. Currently she is associate professor of Logic and Philosophy of Science at the Dipartimento di Elettronica, Informazione e Bioingegneria of Politecnico di Milano. Her main research interests include: the philosophical foundations of artificial intelligence and robotics, and the philosophy of computing sciences and information, with particular attention to the philosophical issues of computational science and the epistemology of experiments. At the TU Delft a vacancy has opened up for a postdoc for two European project in the field of Responsible Innovation. This position is located in the Section of Ethics and Philosophy of Technology of the Faculty of Technology, Policy and Management, Department of Values, Technology & Innovation. Please apply by sending a short motivation letter and a CV to Ibo van de Poel, i.r.vandepoel@tudelft.nl no later than Friday, July 01, 2016. Job interviews are (provisionally) planned for Wednesday, July 06, 2016. We are looking for a post-doc researcher that can contribute to two European projects (PRISMA, CANVAS) in the field of responsible innovation. The majority of the activities are related to the PRISMA project (about 0.5 fte of the 0.7 fte for 3 years) . This project researches the challenges for implementing Responsible Research and innovation (RRI) in industry through a number of pilot projects in companies. The CANVAS project aims to develop a community of legal and philosophical scholars and empirical researchers to share their experience and contribute to value-driven cybersecurity. A short summary of both PRISMA and CANVAS are provided below. The candidate will also be involved in teaching. We look for a candidate with a PhD on a subject relevant to responsible innovation, (engineering) ethics or corporate social responsibility. Apart from having good academic qualifications, as proven for example by a PhD thesis and scientific articles, the candidate should be willing and able to engage with industry, be well-organized and be able to keep deadlines. The position will allow you to expand your international network, and to work on academic publications and teaching in a stimulating academic environment. Participation in project meetings etc. There is now only limited experience with RRI in industry and there is also limited evidence of the added value of opening up the innovation process in industry for social engagement and gender considerations. We will overcome these current limitations by carrying out eight RRI pilot projects in a real-world industry context. To establish the added value of the RRI approach and the gender dimension in and for industry, we will assess the pilot projects on a number of product and process RRI dimensions and compare the score of the pilots on the relevant RRI dimensions with the score of similar projects in the same companies in which the RRI approach has not been followed. We focus on implementing RRI for some of the major technological challenges in the EU including nanotechnology, synthetic biology, Internet of Things and self-driving or automated cars. These are all transformative technologies that have the potential to transform existing modes of production and to change the relation of the company with users, suppliers or other stakeholders. The pilots aim at integrating RRI in the CSR (Corporate Social Responsibility) policies of the participating companies. Some pilots will take place in private companies and some in public-private partnerships (PPPs). The project will be supported by extensive stakeholder consultations and dialogues. These will feed into the set-up and the carrying out of the pilots. The project will result in a RRI-CSR roadmap for transformative technologies. The roadmap will be widely disseminated through the partners’ extensive industry network, and through industry branch and CSR organizations. An important means of dissemination will also be the MOOC (Massive Open Online Course) on RRI in industry. The dissemination is expected to lead to a better uptake of RRI approaches by industry. This will also contribute to the competiveness of the European industry. The growing complexity of the digital ecosystem in combination with increasing global risks entail the danger that enforcing cybersecurity may bypass other fundamental values like equality, fairness or privacy, whereas downplaying cybersecurity would undermine citizens’ trust and confidence in the digital infrastructure. Technology developers as well as legal and philosophical scholars and empirical researchers have dealt for many years with cybersecurity issues, although from very specific angles. What is missing is community-building that unifies these perspectives from the presupposition that technology development in cybersecurity should incorporate European values and fundamental rights. Constructing this community – an alliance for value-driven cybersecurity – is the central aim of the CANVAS consortium. CANVAS consists of partners from different scientific traditions – ethical, legal, empirical and technological – with unique competences and broad contact networks such that they can serve as “seed crystals” for community-building. The consortium will take three domains of application with unique value-profiles and complementing cybersecurity exigencies – the health system, finance, and police / national security – as starting point for outlining problems related to value-driven cybersecurity. Using a three-step process, CANVAS will (1) structure existing knowledge, (2) design a network for exchanging knowledge and generating insights across domains, and (3) disseminate the insights gained through three means: A reference curriculum for value-driven cybersecurity with a focus on industry-training, briefing packages for policy stakeholders, and a MOOC (massive open online course) on value-driven cybersecurity. Furthermore, the alliance that should result from this community-building will allow for self-organization among alliance members for tackle specific research questions that emerge out of knowledge exchange in future proposals. The Faculty of Technology, Policy and Management contributes to sustainable solutions for technological challenges in society by combining insights from engineering with the humanities and social sciences. The Faculty is equipped with excellent research and teaching facilities. The Department of Values, Technology and Innovation (VTI) is one of three departments in the TPM Faculty. It uniquely comprises philosophers, economists and risk scholars. It studies how to develop and diffuse responsible technological innovations that reflect deeply held social and moral values. The department is one of the largest groups in the world studying value aspects, economics and risks for a wide range of sociotechnical systems. The department plays a leading role nationally and internationally in research in responsible innovation and value-sensitive design. The Ethics and Philosophy of Technology section is one of three sections within the VTI Department. The section plays a central role worldwide in research on ethics and philosophy of technology. The group participates in the 3TU.Centre for Ethics and Technology, a centre of excellence and the world-leading centre in the ethics of technology. The group’s research covers a broad spectrum, ranging from applied research in collaboration with engineering scholars, experimental and empirical ethics in collaboration with social scientists, and foundational research in meta-ethics, risk theory, ontology and philosophy of science and design. 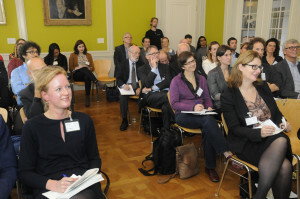 Conference: How can resilient infrastructures contribute to social justice? Taking place 2nd of June 2016 at Technical University Delft. In the last decade, resilience has become a leading paradigm for thinking about risks and safety threats, ranging from climate change and natural hazards to threats related to economic crises, migration, and globalization. Resilience roughly refers to the capacity of a system to respond to and recover from threats and it is often thought to contribute to a better – that is, a safer and more just – society. However, this claim is not uncontroversial. Some also argue that the resilience paradigm primarily benefits the people who are already quite well-off at the expense of disadvantaged groups. The focus in this workshop is on the relation between resilience, technology, and social justice. By bringing together different disciplines, we hope to shed light on the question how resilient infrastructures can contribute to social justice. The session is a co-production by Delft Deltas Infrastructures & Mobility Initiative (DIMI) and the 3TU.Centre for Ethics and Technology – 3TU.Ethics brings together the expertise of the philosophy departments of the three Dutch technical universities in the field of ethics of science, technology and engineering. On September 21, 2016, 3TU.Ethics member Neelke Doorn will speak at the meeting of the VVM (Dutch Association of Environmental Professionals) about the ethical aspects of traces of drugs in the water cycle and what the health care sector can do about it. Follow this link for more information about the program. The Dutch philosophy blog ‘Bij Nader Inzien’ published an article by Neelke Doorn about the professional responsibility of the academic philosopher. You can find the article here (in Dutch). The Netherlands faces a challenge: a permanent solution for the disposal of radioactive waste has to be found. Even though the national government has time, it should take action right now. During this symposium, a fruitful discussion arose among a variety of stakeholders and interested people, about the ethics and challenges of involving the general public in decision-making about long-term radioactive waste management. Decision-making about long-term radioactive waste management is characterized by technical uncertainties, a very long time horizon, ideas of the public, political preferences, international influences and ethical concerns. What are the ethical issues of long-term radioactive waste management and what is the role of the public in the associated decision-making process? Both the Rathenau Instituut and the TU Delft recently published about this topic and jointly organized a symposium that took place on Wednesday October 28 at the Koninklijke Schouwburg in The Hague. Melanie Peters, director of the Rathenau Instituut, kicked off the day by welcoming the variety of people attending the symposium. Her message was clear: we need to have a dialogue about long-term radioactive waste management in order to form a complete picture of the issue, which in turn should form the foundation of future policy. Following Melanie Peters, every EU member state is obliged to formulate a national program for the long-term radioactive waste management For the Netherlands, the Authority for Nuclear Safety and Radiation Protection (ANVS coordinates this national programme). Marco Brugmans, director of the ANVS, emphasized that the Netherlands has the time (approximately 100 years) to prepare the route to disposal because at the moment, it has a unique and safe central storage. This also means that the ANVS has the opportunity to do it carefully. To do so, the ANVS will set up an advisory group consisting of all stakeholders to do so. The outcome of the symposium will provide an important starting point for this advisory group a unique opportunity to exchange ideas with regard to long-term radioactive waste management. The remainder of the day was divided in two parts: the first part of the day was about public participation and the associated Rathenau Instituut publication ‘Enabling Participation’ and the second part of the day was about the ethics of nuclear energy, inspired by two publications of the TU Delft, the book ‘The Ethics of Nuclear Energy. Risk, Justice and Democracy in the post-Fukushima Era’ and the volume ‘The socio-technical challenges of Nuclear Energy Production and Nuclear Waste Management‘ of the Journal of Risk Research. 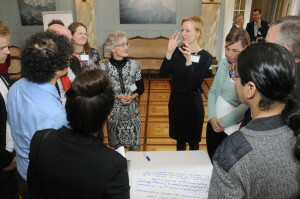 Since public participation is part of the national program the Dutch government is in need of insights on how to involve the public in the debate: at what stage should public participation come in and in which form? The Rathenau Instituut, commissioned by the ANVS, looked into this complex question by organizing focus groups, in-depth interviews and a literature study. Annick de Vries, project leader, explained that trust and willingness are key to the success of a participatory approach. The findings of their report show that both trust in the central government and collective willingness to participate are currently limited; therefore steps must be taken to ensure those conditions. The general public should also not be the only party to participate: the government, stakeholders and the scientific community are also important to consider. The participation itself should be organized by using issue-based participation clusters (this concept is based the idea that the degree of participation, the method of participation and associated participants of decision-making about an issue of radioactive waste management may differ). For a panel discussion Ansi Gerhardsson (Swedish Radiation Safety Authority), Matthew Cotton (University of Sheffield), Anne Bergmans (University of Antwerp) and Arnoud van Waes (Rathenau Instituut) were invited. They were all assigned a statement about public participation and radioactive waste management. Anne Bergmans was asked if she thought it is effective to jointly design a process of public participation, in order to get shared acceptance. She wondered: acceptance of what exactly? It is not a matter of acceptance, but it is rather about ownership of the problem. Another question was if the existing ministries and authorities are e right ones in organize to organize public participation. According to Ansi Gerhardson we are all actors with different roles, we need to define those roles and not limit ourselves to one body. Matthew Cotton argued that the discussion about (public participation on) radioactive waste management is separate from the decision about the future of nuclear energy. We can talk about toxic waste without talking about nuclear energy but we cannot talk about nuclear energy without discussing toxic waste as well. Finally, Arnoud van Waes concurred with the statement that we have enough time ahead of us for the planning, but he emphasized the urgency of starting the preparations right now. We have to reflect upon the agenda and start learning from how other countries deal with for example the site selection. These statements of course provoked a more interactive form so they were evaluated in Open Space group discussions. According to Behnam Taebi (TU Delft), who kicked-off the second part of the day, public participation to increase acceptance is necessary but not enough. We are now looking into multinational solutions for radioactive waste management. Those advocating multinational solutions argue that they should be accepted by the local community. Social acceptance is necessary but not sufficient when proposing multinational repositories. They need to be ethically acceptable. These and many other ethical aspects associated with nuclear energy production and radioactive waste management are at the heart of two recent publications of TU Delft, namely an edited book on ‘The Ethics of Nuclear Energy’ (Cambridge University Press) and a special issue of Journal of Risk Research on ‘The socio-technical Challenges of Nuclear Energy Production and Nuclear Waste Management’. 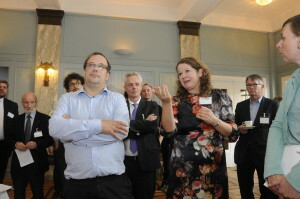 Involving the public is also about building sustainable relations with future communities according to Anne Bergmans. Any decision on long-term management – including decision not to act – has implications for communities where waste is currently being produced, treated, and (temporarily) stored. It is about the ownership of the problem. Ibo van de Poel proposed another understanding geological disposal, we should treat nuclear energy production and radioactive waste management as a social experiment, an idea that was contested by Charles McCombie (Executive Director of Arius Association) during the discussion. In debating the moral acceptability of nuclear energy technologies and radioactive waste management, we should take into account their uncertain and partly experimental nature. Finally, Sabine Roeser introduced the notion of emotions in risk communication. Emotional responses in decision making about nuclear waste disposal are not signs of irrationality, rather, they can point to important ethical considerations that should be taken seriously. Facing the future: nuclear waste is here to stay! Nuclear energy seems to be expanding, so is the radioactive waste problem. In dealing with radioactive waste management we might have the time, but we should also start taking action right now. Ansi Gerhardsson, head of section of the Swedish Radiation Safety Authority, also stressed the importance not to delay the decision-making process about radioactive waste, in order to foster societal acceptance for the decisions to be taken. All the related questions such as the moral acceptability and public participation, but also practical matters such as site selection are rather complex issues. In this symposium we had a fruitful discussion with people from different backgrounds and from different countries. Hans Codée (former Covra director) appreciated the fact that the symposium was not only about technocratic opinions, but also about influences from the social sciences. He hopes this approach will be exemplary for authorities and ministries. Melanie Peters concluded the day with “radioactive waste is here to stay, so will the discussion about it” and her hope that the ANVS will take up the challenges that were discussed during the day. With more questions about the ethics of nuclear energy, do not hesitate to contact the TU Delft. With more questions about involving the public in radioactive waste management, do not hesitate to contact the Rathenau Instituut. The Dutch newspaper Trouw published an op-ed about value sensitive design and the Volkswagen scandal by 3TU.Ethics member Neelke Doorn. See http://www.tbm.tudelft.nl/nl/actueel/laatste-nieuws/artikel/detail/neelke-doorn-in-trouw-over-volkswagen/ (in Dutch). Do not use! Use News instead. Items posted here are not displayed anywhere.